This FREE Vocus White Paper explores how to add social to every marketing activity in order to amplify marketing impact, drive customer, client and audience engagement as well as increasing incremental sales whilst staying within the new rules of social engagement in accordance with UK and EU laws. 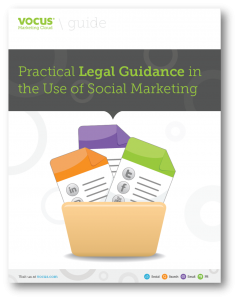 The Vocus White Paper is written by Ardi Kolah, best-selling author of Essential Law for Marketers; Mark Warby QC; Jonathan Coad and Felicity McMahon who are all leading practitioners in this area and help you take the guess work out of your social marketing efforts. see what the future holds in the use of social media in marketing. Best-selling author of Essential Law for Marketers 2nd Edition, published by Kogan Page (2013) and available on Amazon. Over 20 years’ PR and marketing experience and blogger for Brand Republic. Independently ranked by the CIM as one of the top 50 gurus in the industry. Master of Laws from King’s College and University College London. He appears regularly as a commentator on BBC, Bloomberg TV and marketing media. A specialist in media, entertainment and communications, he’s joint Head of Chambers at 5RB. Has acted for claimants and defendants in comparative advertising disputes and recently acted against the ASA in a judicial review over a ruling on online advertising. He is an editor and author of The Law of Privacy and The Media 2nd Ed (OUP, 2011) and a contributor to Blackstone’s Guide to the Defamation Act 2013. Felicity McMahon is a barrister at 5RB practising in media law. She acts for both claimants and defendants in areas including defamation, privacy and confidence, copyright, data protection and other media related areas of law, sports law and public law. Prior to joining 5RB Felicity worked for the Legal Policy Team at the Ministry of Justice and at the Law Commission. Felicity is regularly asked to comment on developments in media law such as the Defamation Act 2013, the Royal Charter on press regulation and social media and the law and is a contributor to Blackstone’s Guide to the Defamation Act 2013. A partner at leading media law firm Lewis Silkin, Jonathan acts for publishers, broadcasters and new media clients including BSKYB, Virgin Media, Comedy Central, Fremantle Media and MTV dealing with IP, libel or privacy claims, and assists them to minimise the risk of such claims. He also works to protect the IP, brands and reputation for a wide range of media and entertainment clients, and has extensive experience both of the regulatory and judicial forums for resolving defamation, privacy and related disputes.